I first got into Maynard's stratospheric trumpet exploits back around 1981. Another trumpet player brought a tape (remember those?) of Birdland into high school, and I'd never heard anything like it. I was immediately hooked, and went out and started buying up whatever albums of his I could find. Initially I was drawn to more of the rock/jazz fusion work of his Columbia Records era ('69-'82) although that was certainly a mixed bag, notorious for such musical catastrophes as 'Theme From "Battlestar Galactica"' and 'Rocky II - Knockout'. Featuring a punching bag solo. But that's not this album. I'd also found some of his older work dating to the early 50's (the Mercury era) and the late 50's - early 60's (the Roulette era). Not much, but a few compilations and used records that I was able to find at the now-defunct and sorely-missed Bud's Jazz in downtown Seattle. I spent a lot of money down there. Somehow though, I never found Trumpet Rhapsody. My parents did. To this day, I don't know how or where they found it (I should ask, but I suspect they probably wouldn't remember), or how they knew that with all the albums I already had, that that one wasn't among them. More over, they managed to find one of Maynard's best albums, and at the time it was over a dozen years old, and it was absolutely mint. I still remember getting it (for Christmas I believe) and being floored by all of this. And they say parents just don't understand. Anyway... this is sort of an oddity in Maynard's career. After Mercury and Roulette, came a brief stint with Mainstream, and then, well... nothing. He drifted from label to label, disbanded his big band, and sort of dropped off the radar for awhile. This album was recorded in late 1967 in Germany with an all-German radio band (Rolf-Hans Müller's Südwestfunk Big Band, to be exact), and initially released just over there (gesturing in the general direction of Germany). However, when Maynard's popularity was on the rise again, the album eventually did see a stateside reissue, which is how I ended up with a copy over a dozen years later. And now, it's finally on CD! Something I never thought would happen. With the major label releases, pretty-much everything of Maynard's has seen release on CD. But there was no sight of this one. 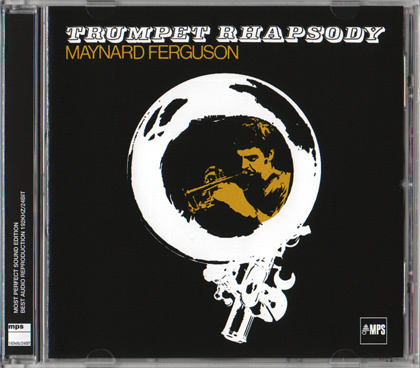 Until, that is, someone on the Maynard Ferguson message board tracked down the company that owned the rights to it, and wrote them a letter. Lo and behold, some six months later... it's on CD! It just goes to show, it never hurts to ask! Not that it's been that easy to get ahold of. I initially ordered it through Amazon (which took awhile, since initially it didn't even show up in their U.S. store). Then after it had been on order awhile, Amazon wrote saying, "Sorry. We can't get it right now. Do you want to cancel?" I wrote back, "No." Eventually, an Amazon partner store (Grooves, Inc., out of Switzerland) had it, so I ordered if from them. Then my original Amazon order shipped. So then I had to cancel the Grooves, Inc. order. But finally, today, it arrived. It sounds excellent, too. Even though my LP never sounded bad, having a CD freshly remastered from the original tapes is almost always preferable. The band is tight, and really swings. The soloists are exceptional (they have a couple of amazing sax players in there) and Maynard is about as good as I've ever heard him. I don't know how long they had to rehearse together, but if you didn't know this wasn't his regular band, you couldn't tell by listening. The reverb is a bit much at times, but maybe that's just an effect of where they were recording. Still, it doesn't detract from what is an absolutely excellent, first-rate big band jazz album. From the high-energy opener "It's Almost Like Being In Love" to Maynard's epic foray's in "Olé", to the driving, solo showcase of "Got The Spirit", the album shows off Maynard's versatility, tight ensemble work, a rock-solid rhythm section, and virtuoso soloing throughout. The only thing that's a shame, is that this is the only album Maynard ever recorded with these guys. But at least now, we have it on CD. The only negative I have about it (besides the difficulty in obtaining it) is that the original liner notes are printed in practically microscopic type (a result of simply scaling down the LP artwork to the size of a CD). But that's okay, because a) it's written in German anyway, and b) I still have the English liner notes on my original LP. Grab one if you can.